Graphic Ink is more of a comics anthology rather than an artbook. It's a very thick book at 368 pages with hardcover. The reproduction is fantastic. I don't understand why Robin was chosen to show his crotch on the cover though as there are other good cover choices in the book. It bemused me when I first saw the cover. 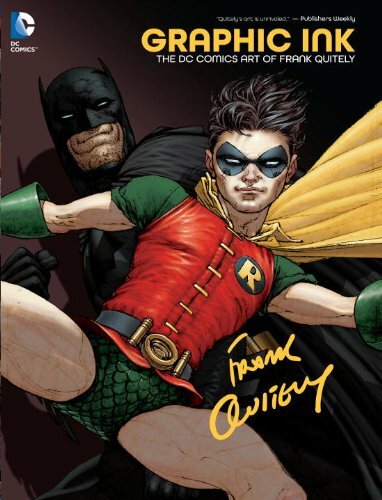 The bulk is filled with comics that Frank Quitely has created since 1995. It starts with the lesser know titles and perhaps more underground comics, such as stories about aliens and Area 51, Salvador Dali and other peculiar stories. After that it's followed by more mainstream titles such as for Batman and The Sandman: Endless Nights. Some of the splash pages and covers are for Flex Mentallo, Books of Magick, We3, All-star Superman, Batman and Robin and a handful of others. It's a good collection for Frank Quitely fans who want to collect the older stories, or catch up with what they have missed. There's not much text talking about the background of the work and even the afterword by Frank Quitely is just a one page essay which is too short for the amount of work shown in the book. This would be a letdown for those looking to learn more about him. Overall for the price of the book, if you like Frank Quitely comics, it's quite worth the purchase.